RAID, the final frontier. These are the voyages of...ah, who am I kidding? 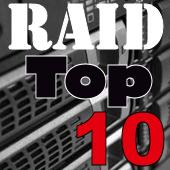 Choosing to implement RAID today isn’t embarking on a mission to boldly go where no one has gone before. This technology has literally been around for years, and today RAID support can be found within most operating systems, integrated on motherboards, or easily added to any system as a 3rd party controller for almost nothing (quick search on Amazon yields controllers for less than $30). With its wide availability, you may find yourself at some point contemplating taking the plunge and configuring a RAID setup on your own system. However, before doing so, there are some things you should consider. Read more at TechWareLabs.